A happy lappy new year. May the currents be with you! 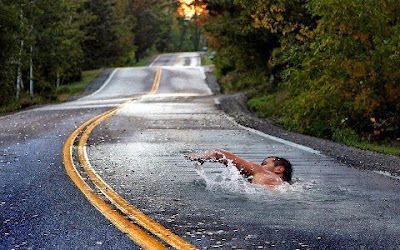 Hope you have a swimmingly great year. "It's Not as Simple as You Think." A review of a quirky book in LA Weekly addresses this pressing issue, Does Santa Exist?. The book purports to examine the notion of whether Santa exists, based on a wide ranging survey of religions and religious studies ideas. Fans of The Big Bang Theory know the character of Sheldon Cooper as a nerdy, Klingon-speaking manbot who, according to his friends, is one lab experiment away from turning into a comic book villain. He’s a theoretical physicist who has no use for human contact, feelings or sentimentality, especially around the holidays; he calls Christmas “a bunch of bologna created by the tinsel industry.” Naturally, he doesn’t believe in Santa. I'll just add here my agreement that it's clear - they have way more complicated stories than we do. We have a holiday based on one jar of oil that lasted longer than it should have - one time more than 2000 years ago. They have a magical guy who comes in a flying sled with presents - every year for every child - from a workshop at the North Pole. We may want to work on our stories. Atlantic: Why Do American Jews Eat Chinese Food on Christmas? The Atlantic asks, Why do American Jews Eat Chinese Food on Christmas? I always assumed it was because all of the other restaurants were closed! Schumer might but editor Chandler has more to say about this matter up to and including this bon mot, "I would argue that Chinese food is the ethnic cuisine of American Jews." My friend has passed away. I am grateful to have known Gil for so many years and to have considered him to be a friend. He was a great person, sincere and sensitive and positive in every way. He was meticulous in his cooking, in his writing and in his relationships, always seeking the right ingredients and ever particular about all of the recipes of his life. He accomplished a great deal, and still I feel he was taken before his time and that we will sorely miss his voice in our communities. Mr. Marks wrote five books that chronicled kosher menus through the centuries and examined the role of food in the establishment and growth of cultural traditions. 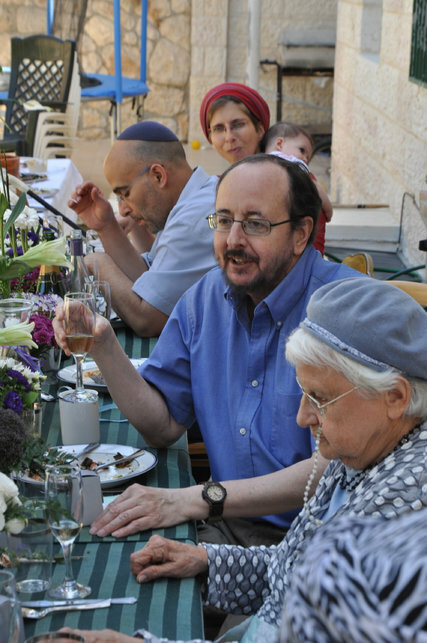 Gil Marks, a culinary historian who wrote widely on the relationship between Jewish food and Jewish culture in a manner that was both scholarly and friendly, died on Friday in Jerusalem. He was 62. The cause was lung cancer, his niece Efrat Altshul Schorr said, adding that Mr. Marks was not a smoker. Mr. Marks studied for the rabbinate at Yeshiva University in New York, but he burrowed into the history and culture of the Jews more through the recipe book than the Talmud. Still, some would argue that his work was, in its way, Talmudic — full of information and interpretive wisdom on the foods of Jewish tradition and the governing principles of cooking and eating them. He was the author of five books, an oeuvre that not only provided a recipe-by-recipe chronicle of kosher menus through the centuries but also examined the role of food in the establishment and growth of cultural traditions. Hanukkah has its avatars. I wrote about this in my 2011 book, "God's Favorite Prayers ." ...The concept of avatar has several meanings. First an avatar can be an embodiment or a personification of a substantial idea, for instance, "the embodiment of hope"; "the incarnation of evil"; "the very avatar of cunning." In some respects I describe in this book how the prayers serve as avatars of several diverse personalities. In this sense I can say that the Amidah is an avatar of the priest. ... The most recent technological application of the word avatar denotes a computer user's self-representation or alter ego, in the form of a three-dimensional model within a computer game, or as a two-dimensional icon picture on a screen, or as a single-dimensional username within an Internet community. ... On two special occasions, Hanukkah and Purim, we add paragraphs to the Amidah to describe the victories of heroic Jews of the past. I see these hero figures as avatars of the priest. NY Times Advice - Frustrated on Sundays with the Jets and the Giants? Visit the Lubavitcher Rebbe's Grave Instead! In a semi-serious article the times suggests that you spend your Sundays doing more rewarding things than watching the Jets and Giants football teams lose their games. Visit a grave-turned-shrine of a dead rabbi in Queens. 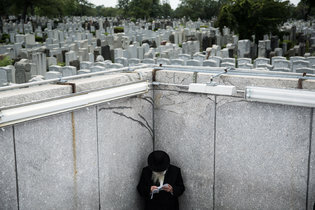 The Ohel is the final resting place of Rabbi Menachem Mendel Schneerson, who was the leader of the Lubavitch sect of ultra-Orthodox Judaism. 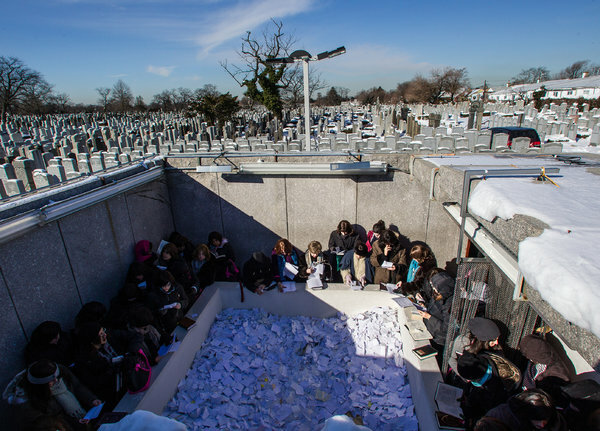 Schneerson, known as the Rebbe, died in 1994, and in the past two decades his burial site has turned into a place of pilgrimage for Jews, who trek here from around the world to write prayers on scraps of paper and toss them on the Rebbe’s grave — 24 hours a day. The site, little known outside the Jewish community, is in fact a nondenominational place of prayer, where any visitor is allowed to walk right in and toss a paper prayer into the mix. Perhaps there you can pray for our two lousy teams. I don’t understand why my local rabbi has been saying outrageous public things — preaching and publishing political rants. I want to know what makes a rabbi do this, and I need to know what to do about it. You ask why a person engages in the kind of public rants that bring humiliation to himself and his family and his extended community. O.K. That person first may be driven by hereditary factors. He may have a variety of the thrill-seeker gene that makes him crave attention and controversy. At the same time, his innate circuit breaker, the psychological mechanism or filter that normally protects a person against putting himself in danger, or engaging in self-destructive, antisocial behavior, appears to be defective. Such a person would benefit from therapy to help him understand his risky drives and deficiencies and to help him become more vigilant in monitoring his problematic behavior. The issue of your rabbi’s contentious behavior does prompt me to discuss more general related aspects beyond this rabbi’s problem. When any rabbi veers off into politics, I think that is a bad thing. He’s not doing his job. A rabbi is by definition a teacher of Torah. Rabbis are not trained in politics, nor are they employed to engage in politics. They become rabbis by passing exams in Torah texts, including the oral Torah, the Mishnah, Midrash, and Talmud. Teaching Torah (or any subject) is a respected profession that someone enters through preparation, expertise, and apprenticeship. Politics is a different profession, and it is entered by another route of training and experience. Through the ages, rabbis on many occasions have ventured into politics — as politicians, not as rabbis. A few have succeeded. Some have failed dramatically. 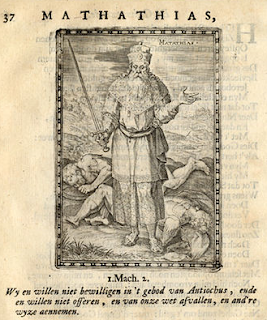 One of the greatest Torah scholars of our history, Rabbi Akiva (whom I referred to above), led his students into a disastrous revolt against Rome in the second century CE. He unsuccessfully supported the rebellion of Bar Kochba, and as a tragic result he was tortured to death by the Romans and thousands of his followers were massacred. Much more recently — in 2012, as you may recall — one of our neighbors in Bergen County, a celebrity rabbi and author, ran for Congress. He was trounced in the election. Though he emerged from that experience personally unscathed, the example confirms the pattern. Rabbis throughout the ages have made poor politicians. I prefer to think that there’s nothing specific to the teachings of the Torah that make someone a bad politician. But it’s worth speculating further on this matter. Perhaps the idea that God is behind you and that makes your ideas right and worthy is a weakness, not strength, to those who enter the arena of public political discourse and activity. In that venue ideas rise and fall on their merits and their appeal, not on their claims to divine sponsorship. To be sure, rabbis are not easily adept at being political. Yet in spite of that you would think that they ought to respect the accepted modes of public political discourse. The rabbinic literature that they know is rigorous in its formulaic requirements and its rhetorical and logical forms. Free-style ranting is not one of its genres. And going back further to the classical biblical prophets, we find the same. The exhortations of those Israelite preachers use controlled manners and speech with sharp and clear moral and theological messages. The dangers of mixing politics and religion are even more pronounced and complex when you consider that many varieties of religious terrorists incite their followers to commit atrocities and crimes against humanity based to a frightening extent on religious grounds and on claims of their gods’ approvals. A few years ago, at a course on religion and terrorism I taught at FDU, I analyzed many instances of terrorism committed by members of religious communities. I took cases drawn from Sikh, Buddhist, Hindu, Aum Shinrikyo (a Japanese cult), Christian, Jewish and Islamic traditions. The dangerous recent historical record that I examined in that course of the mix of religion and terror is extensive, impressive, and terrifying. My advice to you as you confront your immediate situation is best expressed in one word: beware. A rabbi or any religious leader who goes off like a loose cannon in unpredictable rants advocating racism, violence, or terrorism ought to make you cringe. Stay far away from him. Nothing that you can do or say will deter him. He is a danger to your community, to stable society, and to civilization. He does not represent any aspect of what is worthwhile in either the clerical professions or in the political realms. And he does not represent in any way what we good ordinary citizens want in a just and righteous world. Tzvee Zahavy earned his Ph.D. from Brown University and rabbinic ordination from Yeshiva University. 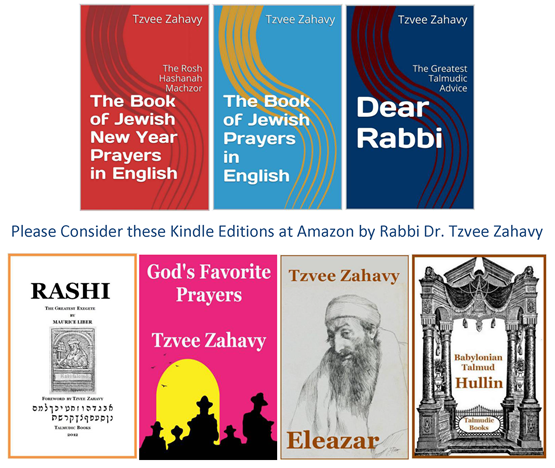 He is the author of “The Book of Jewish Prayers in English,” “Rashi: The Greatest Exegete,” “God’s Favorite Prayers” and “Dear Rabbi: The Greatest Talmudic Advice” — which includes his past columns from the Jewish Standard and other essays — all available as Kindle Edition books at Amazon.com. After the recent attack in Jerusalem, where terrorists killed four men in a synagogue, I saw posts on my Facebook newsfeed blaming the policies of President Obama for the terrible incident. That disturbs me because I don’t see how someone can connect him to violence in another country. Hmm. I stubbed my toe the other night while I was walking in a dark room and I exclaimed, “Oh Jesus” even though I’m a good Jew and Jesus had nothing to do with my mishap. Seriously, let’s be clear. First of all Obama is the president of the United States, not the prime minister of Israel. His job is to take care of Americans, not protect Israelis from terrorists. And second, he is in no way responsible for causing attacks anywhere in the world. Those who heap blame on Obama for the ills of our globe do that because they don’t like him to begin with. They think they can besmirch him by arbitrarily piling fault upon him. It is bad rhetoric and nothing more. Benjamin Netanyahu is the prime minister of Israel and is much more the right person to charge for bad policies that lead to terrorist attacks in his country. But in reality, terrorism is not at all a result of flawed strategies of our leaders or of our governments. It is evil activity planned and carried out by those of our enemies who want to harm us and disrupt our lives. So if you must, blame our enemies, not our leaders. But if you insist on blaming our own leaders, then you might argue that the ultimate questions about the death of those four innocent people in synagogue remains primarily a theological issue that you ought to direct to the leader of leaders — God. For those of us who believe that God cares about our everyday lives, it is fair to ask how a just God allows terrorists to kill saintly Jews who devoted their lives to Torah and, on top of it, while they were engaged in prayer in the synagogue. Hence I agree with you that it makes no sense for people on Facebook or anywhere else to blame Obama for terrorist murders in Jerusalem. My advice for you is as follows. On Facebook, if you don’t want to see nonsensical posts, you can unfriend the people who send them, or suppress their posts from your news feed. In real life, however, I’m sorry to say I have no bright advice for you. We have no way to pull down a menu and turn off or suppress from confronting every day the age-old baffling questions of theodicy, of why God lets such bad things happen to such good people. There is a story in the Talmud (Menahot 29b) that depicts Moses asking God why he allowed the Romans to torture the great Torah scholar Rabbi Akiva. In that narrative Moses demanded to know from God, “This is the Torah and this is its reward! ?” And in that text God gave Moses no effective answer or explanation. I can advise you not to tolerate those who blame Obama for terrorist evil. But, sorry if this disappoints you, I can’t offer in this column any better response than the Talmud does about the accountability of God.